Trying to talk about Israel to children who are only vaguely aware of their own country (or even the concept of what a country might be) is always going to be a bit hit and miss, but that’s no reason not to try. Here’s a way to make it a bit more interactive as a group activity for young children learning about Israel. I printed off a bunch of little Israel-themed pictures, and cut them out. On the back of each I wrote a question or a fact. Then when I met up with my group of Shabbat Tot kids and their parents, I let the children choose some pictures and their parents read out the question/fact (and contributed to the answer/discussion.) Quite a few of the parents have spent time in Israel, either on kibbutz or as tourists, so it was great to hear them share their memories. Older children would of course be able to read the text by themselves. Here is a sample of the pictures/questions. Map of Israel – Where is Israel? I took a globe and we found where we live, where Israel is, and the countries we had all been born in/visited recently. Jerusalem/Western Wall – What is the capital of Israel? What is in this picture? 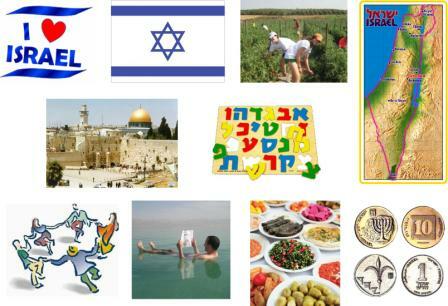 Israeli foods – What do people eat in Israel? Israeli flag – What is on the Israeli flag? We compared it to a tallis with blue stripes. Israeli coins – What is Israeli money called? We passed around a selection of Israeli coins. Man floating in the Dead Sea – What is something unusual you can do in Israel? Lots of parental reminiscing at this one! Workers on a kibbutz – What is something different about farming in Israel? Israeli dancers – Let’s learn an Israeli dance together. This was loads of fun. I heart Israel – Why is Israel special? You can think up as many reasons as you like. Here are my Israel pictures.